2/25/18 #Public Levels Ready Announcement "Black Wall Street Pop Up Shop"
The Black Wall Street pop up shop is an event that tailors to all up and coming entrepreneurs and business owners. 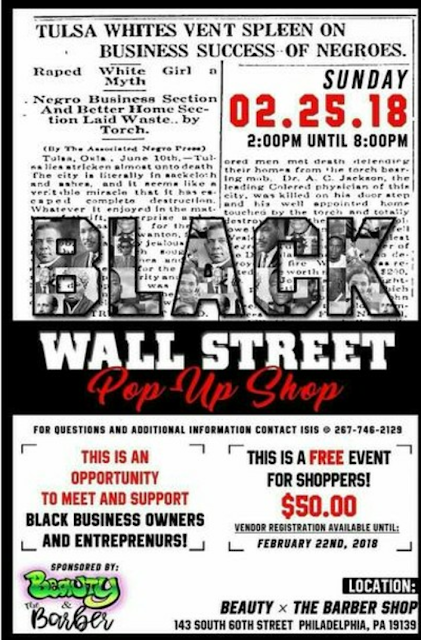 This event's main purpose is to give the appropriate exposure and encourage entrepreneurs and consumers of the African-American race the opportunity to trust businesses who are owned by people with melanin. What better way to end the celebration of Black History Month then by circulating the black dollar amongst trustworthy up and coming black owned businesses. Time: 2:00 p.m. UNTIL 8:00 p.m.